This Screen Protector is Made from high-quality heat treated and toughened tempered glass and say goodbye to the fear of unexpected falls and breaks that make your life unpleasant, and hello to fearless living. It’s your screen’s guardian and will take good care of your screen. Apple ipod 4th Generation Full Cover 100% Genuine 3D Tempered Glass Screen Protector-clear. 1 x Tempered Glass Screen Protector. We do not accept any responsibility if you ruin your protector due to not applying it correctly such as any air bubbles or dust creeping underneath the glass or if the protector does not stick due to you not cleaning your screen properly. Lamina protectora delantera UNA UNIDAD . efecto MATE para IPOD TOUCH 4 4G. Laminas protector de pantalla delantera de alta calidad. Un solo protector de pantalla de alta calidad. ¿Qué es un protector anti-glare?. TEMPERED GLASS SCREEN PROTECTOR FOR for Apple iPod touch 4th generation. The obvious choice in high-end screen protection for your device, this tempered glass series was found to be amazing when we evaluated it. 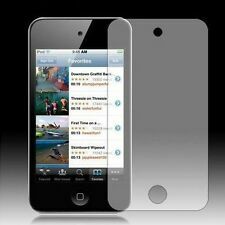 This Gear4 screen protector has been specially designed for your iPod Touch 2nd Generation device. Included with the screen protector is a wet and dry wipe for cleaning your screen. This will reduce the chance of air bubbles and make sure of a good fixing to the screen and the applicator allows you to smooth out any small air bubbles that do appear and help leave the screen nice and smooth. PELLICOLE A SPECCHIO PER iPod Touch 4 4G. Paese di fabbricazione Cina. Tipo Proteggischermo. MPN Non applicabile. EAN Non applicabile. Quantità 2. IL PREZZO E' RIFERITO 2 PELLICOLE SPECCHIO CON UN PANNO PULIZIA. Material: glass. 9H hard Imported Asahi glass with anti-explosion, anti-scratch, even though you use scissor,hamper to hit the screen, it will be ok. Delicate Touch: the self-adhesive silicone can touch on the screen smoothle, it makes the sintallation easy and is more sensitive for operation. The surface of the mirror film is treated with a scratch-resistant hard coat. Application is simple with the film leaving no unwanted residue when removed. Compatible Model For iPod Touch 4th Generation. TEMPERED GLASS SCREEN PROTECTOR FOR for Apple ipod touch 4th generation. Tempered glass screen protector for. The obvious choice in high-end screen protection for your device, the tempered glass series amazed us when we evaluated it. The technology behind these screen protectors bring so many benefits that our competitors just cannot match. First the Clear Screen properties make using your phone outdoors so much easier on the eyes. Crystal Clear Screen Protector is made of high quality plastic material that is very lightweight and impact resistant. This Protector can Fully covers the entire front face (Touch Screen) of your phone for full screen protection. Reflejar el espejo pantalla protector Protector protector de vidrio para Apple iPod Touch 4 4S UK. Protector de pantalla de espejo de cristal se hace del material plástico de alta calidad que es muy ligero y resistente al impacto. Invisible Shield Ultra claro vidrio pantalla Protector para Apple iPod Touch 4 4S UK. Crystal Clear Protector de pantalla está hecha de material plástico de alta calidad que es muy ligero y resistente al impacto. Crystal Mirror Screen Protector is made of high quality plastic material that is very lightweight and impact resistant. This Protector can Fully covers the entire front face (Touch Screen) of your phone for full screen protection. PROTECTORES DE PANTALLA. No se procesan pedidos para envío a los fines de semana o festivos. colecciones no están disponibles. LOS PRECIOS DE ENVÍO. Screen Protectors. Rest of World. Rest of the World First Item: £3.99. Collections are not available. Smartphone Caso y Protector de pantalla Apple iPod Touch 4 / 4G, Case en pink Protector de pantalla. Funda y Protector de pantalla para Apple iPod Touch 4 / 4G. Funda bumper paraApple iPod Touch 4 / 4G. Vidrio templado para Apple iPod touch 6ta Gen (2015) | protector de pantalla para Apple iPod touch 6ta Gen (2015) | protector de pantalla LCD para Apple iPod touch 6ta Gen (2015) | vidrio para Apple | vidrio protector de pantalla Apple iPod touch 6ta Gen (2015). Tempered glass for Apple iPod touch 5th Gen (2012) | screen protector for Apple iPod touch 5th Gen (2012) | lcd protector for Apple iPod touch 5th Gen (2012) | glass for For Apple | glass screen guard Apple iPod touch 5th Gen (2012). Newly designed and Made from high quality heat treated and toughened tempered glass and say goodbye to the fear of unexpected falls and breaks that make your life unpleasant, and hello to fearless living. 6 X PLASTIC ULTRA SLIM LCD SCREEN PROTECTORS FOR IPOD TOUCH 4TH GEN. INCLUDED DRY WIPE. Vidrio templado para Apple iPod touch 5ª generación (2012) | protector de pantalla para Apple iPod touch 5ª generación (2012) | protector de pantalla LCD para Apple iPod touch 5ª generación (2012) | vidrio para Apple | vidrio protector de pantalla Apple iPod touch 5ª generación (2012). Tempered glass for Apple iPod touch 6th Gen (2015) | screen protector for Apple iPod touch 6th Gen (2015) | lcd protector for Apple iPod touch 6th Gen (2015) | glass for For Apple | glass screen guard Apple iPod touch 6th Gen (2015).